The Bo Diddley Beat came from the artist himself, blues legend Bo Diddley (Ellas McDaniel). early forms of latin and afro-cuban rhythms (clave) derived from their respective countries. "Shave and a Haircut",..."Two Bits". lines so it is important to keep a steady tempo to be in sync with them. Many drummers play this beat on the floor tom as mentioned above. the Bo Diddley Beat within a standard, syncopated rock groove on drums. 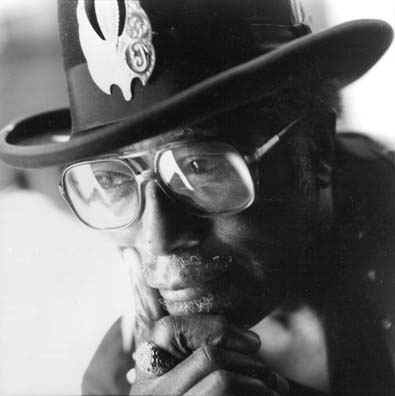 * If you have anything to add to our Bo Diddley Beat page, please let us know. We welcome feedback, variations, interpretations, and any external resources. MusicWear.com - Cool T-shirts for Musicians! industry news, and info on new contests, products, and specials! lesson plans for music educators. - Drum lessons are neatly organized for lesson plan use. and fundamentals to make learning drums and learning the Bo Diddley Beat that much easier. Drum Bum is now giving away a Free T-shirt "twice" a month! 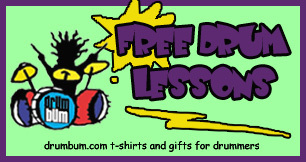 drums t-shirts, hats, decals, drum ties, keychains, posters, necklaces, colored sticks, kids drums, world drums, and awesome drum accessories, clocks, mugs, and tons of free drum lessons and drumtabs for for Drummers!